The GLR GS 54 (model B4003) comes from a fine line of basketball systems produced by Goalrilla. It features a 54″ tempered glass backboard, a 5-inch square pole, and a 2.5′ overhang. The height adjusts from 7.5 to 10 feet with the use of a crank handle mechanism. The pole is powder coated for UV and corrosion resistance. An anchor mount system is used to install the hoop into the ground. Goalrilla backs it with a limited lifetime warranty. It is a little smaller than its big brother the GSII, and it is about $500 cheaper. Tempered glass backboard. This is the highest quality material used for backboards. Hoops at the college and NBA levels utilize tempered glass. It’s 3/8″ thick, which is pretty solid. It’s the most sturdy and durable type of backboard you can purchase, and is best for overall performance. Stable. What makes in-ground basketball hoops ideal is their stability. They’re also aesthetically more pleasing than mounted and portable models. The stability of a hoop is plays a big role in how well it performs. 5″ one-piece square pole. Lesser priced hoops tend to have multi-section, round poles in the 3.5 to 4″ range. A one-piece pole is far more sturdy, and therefore better for performance. Square poles are superior to round ones for the same reason. Of course, the thicker the pole, the better. Crank adjust. This mechanism is the most precise and durable of them all, which is why it’s so commonly used on basketball hoops. Pro-style flex rim. The more expensive the hoop, the more heavy-duty the rim is. The flex-coil construction takes a lot of stress off the backboard to prevent damage. It’s powder coated and has stainless steel components to provide protection from the elements. 2.5 foot overhang. This gives players some space under the basket to maneuver. They can better avoid bumping into the pole, particularly when play gets a little rough. Plus, the space brings some more realism during play. Anchor mount installation. You can remove the hoop easily since the pole isn’t buried in the ground. The pole screws into a plate, so the pole can be removed just by unscrewing it. Plus, it’s a less complicated process than a direct burial. It isn’t a regulation size backboard- The GS54 is a 54”x34” backboard. A regulation size board is 72”x42”. A regulation size backboard is always desirable. That being said sometimes it just isn’t the right fit for everyone. May fall short of some player’s expectations. While the GS54 is a great value for the money, some players who are looking for something similar to what’s in their high school gyms could be disappointed. That being said, this is a very solid offering at this price point. A handful of people at Amazon.com have purchased this hoop. Please go HERE to read the reviews. As a summary of the reviews, there is very little to be disappointed in. It is “awesome” a “great Product”, made of thick steel and will last for a lifetime. The lone one star review is because of missing instructions with the package. This seems to be an anomaly. There are minor complaints about the rim not being the top of the line. The vast majority of reviewers were more than pleased with this product. The Goalrilla GLR GS is similar to the Mammoth 98856, and has a slight difference in price. Goalrilla is one of the best brands out there. If I had to choose between the two, I would go with Goalrilla. Simply put: you can’t go wrong with this hoop. Cheapest place I found to buy it was at http://basketballgoalstore.com. If you have more money to spend, you should consider the Goalrilla GSII. 60″ Tempered glass backboard, 4-inch square pole, 2.5 foot overhang, anchor mount installation. A Poor man’s alternative to a Professional Basketball Hoop. Probably the Highest quality, low cost Hoop System available. 2-section pole, no lifetime warranty. That’s about it. This is a 5 Star – Complete basketball hoop system. Recommended by me as a top basketball hoop for under $1000. Silverback is a division of Goalrilla, who produces one of the best lines of in-ground basketball hoops on the market. The SB-60 features a 60″ tempered glass backboard with aluminum trim. The two-section square pole is 4 – inches thick, and the backboard extends 2.5 feet out from the pole. It adjusts infinitely from 7.5 to 10 feet with the use of a steel actuator. It’s installed using an anchor bolt system. The SB-60 is backed by a 7 year warranty. 60″ tempered glass backboard. This size is ideal for most residences because it’s not too big for a driveway, yet is one step from being regulation size (72″). Simply put, tempered glass is the best of the best. It’s 5/16″ thick, which is enough to provide plenty of rigidity. Handle assist mechanism. It uses a motor to assist with raising and lowering the hoop. Most are completely manual or gas assisted. This if the first hoop I have seen with a motor. Pro-style breakaway rim. I don’t know any specifics about the rim, but it has a pro-style look to it. It’s not exactly the same as what’s used in the NBA, but it’s close. It’s heavy-duty and is built to last. 4-inch square pole. Square poles are more sturdy than round ones, and 4-inches is solid. The thicker the pole, the less vibration a hoop has. 2.5 foot overhang. This provides ample space for play underneath the basket. Plus, it’s safer because players are less likely to run into the pole. In general, this space just allows for more serious play. Pole padding. Many premium hoops don’t come with a pad, they make you buy one separately. The SB-60 comes with one, and this just makes it that much more safe for the players. Anchor-mount installation. This is the best installation for in-ground hoops because it can be removed easily. 2-section pole. It’s thick enough, but you would like to see a one-piece pole instead. Most hoops in this price range have one, so that is a bit of a disappointment. 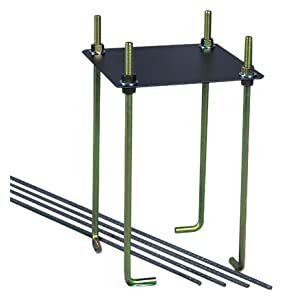 The two-piece pole isn’t as sturdy, plus you’ll have to put put them together during the assembly. 7-year warranty. Not bad, but a lifetime warranty is standard for hoops in the $1000 range. Somewhat Difficult assembly. According to reviews, you will need at least 3 adults to put up the heavy backboard. When I review a basketball hoop, I am always looking for flaws. It’s really hard to find any glaring weaknesses with the SB-60. Even though the 2-section pole isn’t ideal, it’s still pretty solid. After doing some research, I found that that this is probably the best buy for in-ground hoops below $1000. If that is your budget, then the SB-60 is a great choice. If you can go a little higher, I would probably recommend the Mammoth 98862 instead. The 90014 Competition is one of the top in-ground basketball systems sold by Lifetime. It’s suited for a 1-2 car driveway playing area. It features a 54″ tempered glass backboard, a 4-inch square pole, and a 27-inch offset. The height adjusts from 7.5 to 10 feet in infinite increments with the use of the Power Lift® pneumatic mechanism. The Slam-it Ultra rim is made of solid steel and has a wrap-around brace. The The 90014 is backed by a 5 year limited warranty. Dimensions: 58 x 36.5 x 7 inches; 125 pounds. Stability. In-ground hoops are best for stability. The tempered glass backboard adds to this because it’s a heavier material compared to polycarbonate and acrylic. The square 4-inch pole helps reduce vibration. Infinite adjustment. You can raise or lower it to any height between 7.5 and 10 feet. Some mid-level hoops only adjust in increments of 6-inches. Power Lift® pneumatic mechanism. This is a gas assisted adjustment mechanism that makes it easier to lift and lower the hoop. You grab the handle and simply raise or lower it depending on what height you want. The downside is that it may start leaking gas a few years down the road, which can affect precision. Tempered glass backboard. Simply put, tempered glass is the best of the best. It’s used at the college and pro level. It’s heavier, more rigid, and durable compared to other materials. A huge plus. 4-inch thick square pole. Less expensive hoops typically have round poles that are between 3-3.5 inches thick. Certainly, this is an upgrade. The square shape is superior as far as sturdiness is concerned. Overhang. The thicker pole leads to a greater backboard offset, which is the distance it extends out from the pole. A 27″ offset is very impressive for a hoop in this price range. To put into perspective, the Mammoth 98856 is $200 more and has the same overhang. The benefit is more playing space under the basket so players are less likely to bump into the pole. Thin backboard. 1/5-inches thick is below average for tempered glass, as most premium hoops have a 3/8 backboard. But, they also happen to be more expensive. Direct burial installation. While in-grounds do provide more stability than portable hoops, this type of installation does require time and effort. Plus, it can’t be removed. You can purchase a Lifetime ground sleeve for 4-inch square poles. The pole slides into the sleeve so it can still be removed if necessary. However, it’s still inferior to the anchor mount installation. What’s most appealing about the the Lifetime 90014 Competition system is the tempered glass backboard. It’s truly the best for overall performance. You won’t find too many other hoops in this price range with tempered glass. The thick pole and 27″ offset are also positives. The backboard is a bit thin, so I would be careful about hanging on the rim and being rough with it. The installation will also require time and effort. Overall, it’s well worth the price.